NOTE — Before you click on the link for this offer you MUST be in Firefox — IE and Safari doesn’t work!! Head on over here and become a fan and then click on the Mega Mystery tab. 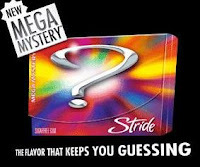 Key in your information and then if you are one of the first 20,000, you will get a coupon for free gum mailed to you! Be sure to check your email if you signed up for newsletters to confirm your email address.